Hey, all (i.e. NOONE!). It's been ages since I've done anything, and I wanted to just let you all (read: NOONE!) know what's happening. I'm not sure what I want to do with this website, or the Coramaximus Entertainment dealy, altogether, but the domain and hosting expires in September. I've been meaning to upgrade/modify/rebuild/start from scratch/blow it all up for quite some time, but I've had trouble figuring out how to go about it and I'm not sure whether to go ahead with renewal or quit the whole game. I've also been looking into moving the site to another web host, as well - one within the Australian shores, to have it closer to home - so there's a lot to think about. Again, just thought I'd put this up to remind you all (again, NOONE) that I'm still alive and that (I hope) this site isn't quite dead, yet. If I do do anything, it will be within the next month or so, so there may be activity here (yay?). Watch this space ' '. Well, I haven't posted anything here for a while - no one really comes here, anyway, but I thought I'd put up the obligatory New Year's post. It's 2012, and hopefully it will wash away the sins of 2011 (speaking more personal than general) like the floods washed away the life and hope away from many places in south east Queensland, last January. A year on, and hopefully, they can return to something they can once more call home. Me, on the other hand, look forward to an end to a university course, and a degree. Degree at last, degree at last, thank God, Almighty, I'll have a degree at last! We are joined to mourn the loss of 2011. That poor year will never have another day, no more future, it is dead and gone. 2011, you will be sorely missed. Sheist! It's been ages. Anyway, I'm on my way to renovating this whole site so it's that much more awesome. Also trying to come up with things to put here, and I will, I swear! If anybody reads this, come visit my facebook @ facebook.com/the.cozburger. Or, if you tweet, come to twitter.com/TheCozburger. Feel free to tell me how awesome or gay this is. That goes for my sprite comics, too. Ok, that's...actually all there is. Well, it's week 2 of my second semester at uni. I ended up passing those units, so that's good, although one was barely done so. On the other hand, I got a 5 in another (a passing grade being 4), so...that's also good. So far, so good, even though I ended up having to enrol in a business unit due to availability and timetable issues. Speaking of timetable issues, I have a pretty packed Thursday, quite the change from last semester when said day was free. In other news, I bought a new TV. And so ends a semester of uni. So far, it seems alright, though I'm not sure if I'll pass all four of the units I undertook. This year has been quite a year for your's truly, and the other end looks to be even greater - Two concerts, and a trip to Thailand are a few things on the horizon. Details to come.........probably never. I have recently purchased a drawing tablet (A Wacom Bamboo Fun Pen & Touch, to be exact) and I'm hoping to bring out some of my creativity with it. 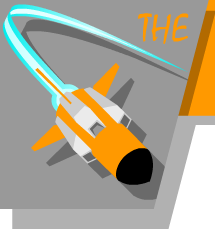 Whatever comes will most likely end up here, at the Awesome Ramjet, so look forward to.........well, something. E3 has recently come and gone, and it was a good one - especially for Nintendo, whose press conference (I believe) blew the other's away. I might some of my thoughts on that on my 'Awesome' Blog - which is to say the place I write about awesome things - sometime, this week. Wow, this has been a long post/rant/sausage. I hope there's someone out there to enjoy this. Have a good one. ......also, The Mex Mix turns...7 on the 26th, but without Sonic Slams (or anything) it means very little. Well, I can safely say that I'm into my 1st year of uni (second year, actually, but that's another story), and I'm slowly but surely settling into my studies - the wrong way to enter a cold pool, but it might work here. In other news, Krispy Kreme have caramel donuts, again (yay). The new Karamel Kreme Eggs, have made my day...twice!